Periodontitis is not called the ‘Silent Killer’ without reason. It attacks the parodontium and the jaw bone in such a way that there are very few people who are aware of this disease and its consequences. Do the first symptoms apply in your case? How does it develop and what harmful effects does it have? How can you recognise it? Shall we just forget about smiling and laughing confidently? This parodontium disease damages the gum and the jaw bone with the help of the bacteria that the plaque and tartar contain. If not treated, it leads to gum and bone recession, bad breath and tooth loss. The disease can be symptom-free as well and that is why it is also called the ‘Silent Killer’. As a result of the ‘Silent Killer’ the remaining teeth have to be extracted as there has bone left that could hold them. Periodontitis has several forms which you can find out here. 2. Gingivitis: Gingivitis makes the gum red and swollen. Because of this the gum starts to bleed more easily. Gingivitis is caused by inadequate oral hygiene but it can be reversed by proper medical treatment and good oral home care. 3. Peridontal pocket: Gums separate from the teeth, forming pockets (spaces between the teeth and gums) that become infected. As the disease progresses, the pockets deepen and more gum tissue and bone are destroyed. 4.Periodontitis: At this stage bone and gum loss are very large. Eventually, teeth can become loose and may have to be removed. How does periodontitis develop and how does it do the damage? 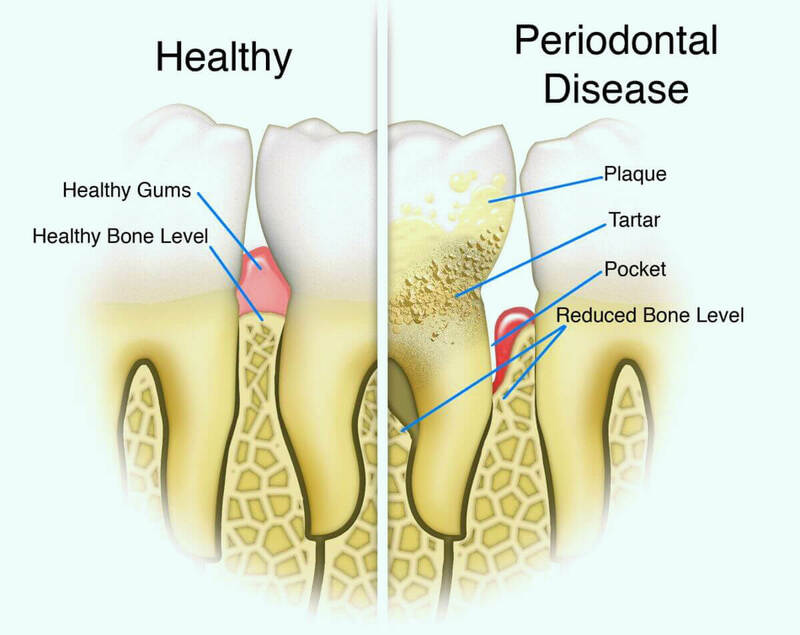 Periodontal disease, also known as gum disease, is caused by the plaque that stuck between the teeth and the gum. It is good to know that plaque and tartar can only develop in parts that are not visible. Sometimes the gum can be swollen, inflamed or bleeding without a reason. The breath is bad and the gum starts to recede. Seldom gum bleeding or swelling can make people think that they accidentally hurt their gum while eating or tooth brushing and bad breath may be the reason for skipping tooth brushing in the morning. In brief, people do not notice these signs though it can result in tooth loss within years - either naturally or by dental intervention to receive stable tooth replacement. Do not be one of them. Be careful and if you have any problems do not hesitate to take action. How can I recognise periodontitis? If you experience one of these mild symptoms it is likely that you have periodontitis disease. Unfortunately, most of the time we only recognize the problem when it is not possible to save the teeth anymore. As a result of partial or full tooth loss we start to smile less and less which leads to constant frustration and feeling ashamed. The greatest disadvantage of periodontitis parodontium disease is not that one might end up with losing all their teeth but the fact that it takes away the self-confidence, enjoyment of being with company and the joy of and eating. There are many way to replace the lost teeth, however, it is not always assured that we chose the method that will be a long term solution. Dentures problem? Self-conscious about your teeth? Let us help you to overcome it! In the last 12 years we have helped literally thousands of people to receive beautiful, strong new teeth and to lead happier and more fulfilled lives. Our world-class implantologists offer a ground-breaking procedure that makes dental restoration possible for almost every patient. It is even suitable for people who have previously failed implantation procedures due to severely atrophied jaw bones and bone recession. With this largely pain free method there is no need to endure a lengthy recovery period or additional surgeries like sinus lift or bone graft. Your world-class implantologist, Dr. Attila extracts your old teeth, if you have any, then inserts the Swiss 5 day implants. Dr. Attila sets up the frame of the bridges while you can take time to discuss the colour and shape of the teeth. You receive your beautiful new teeth and you can eat, speak and smile immediately. this is what you can expect. This man had serious periodontal gum disease and couldn’t eat properly. After having all of his remaining teeth removed he received full jaw restoration with 11 Swiss 5 day implants (BCS/KOS) and a 14 unit bridge on his upper jaw and 10 Swiss 5 day implants (BCS/KOS) and a 14 unit bridge on his lower jaws. He has no pain or anxiety and very happy with his beautiful new smile. Most of this lady's teeth had begun to fall out over the previous 3 years. She was given 8 Swiss 5 day implants (BCS/KOS) and a 12 unit bridge on her upper jaw and 6 Swiss 5 day implants (BCS/KOS) and a 12 unit bridge on her lower jaw. She left absolutely delighted with her treatment, convinced that it was the best thing she had ever done! This man had just two upper teeth and his lower teeth were badly worn. He received 9 Swiss 5 day implants (BCS/KOS) and a 14 unit bridge on his upper jaw and a 12 unit bridge were placed on his lower jaw. He is amazed with the result and never believed a solution was so easily attainable. This lady had dentures for many years but could no longer live with them. She received 9 Swiss 5 day implants (BCS/KOS) and a 14 unit bridge on her upper jaw and 8 Swiss 5 day implants (BCS/KOS) plus a 12 unit bridge on her lower jaw. She finally had the new teeth she had long dreamed about and could consign her troublesome dentures to the past. There is no need to endure a lengthy recovery period as your new teeth will be installed in just 5 days! Dental implants dramatically improve chewing ability and facial appearance, while our patients also talk about how they enhance their quality of life and boost self-confidence! Treatment is conducted by highly qualified implantologists with at least 15 years’ experience in a state-of-the-art clinic. Full jaw restoration is quicker and easier than you may think! Beautiful new teeth in just 5 days really is possible. Dental restoration without sinus lifts or bone grafts, even for those with low bone density or gum disease.